Reboot with Joe Juice Diet was developed by Joe Cross who gained international recognition as he filmed his experiences when he juice fasted for 60 days. During this journey Cross transformed his life overcoming obesity, negative lifestyle habits and a variety of health conditions. Since the documentary of these events, “Fat, Sick & Nearly Dead“, was released, Cross has been promoting the health benefits of juicing. In The Reboot with Joe Juice Diet, he shares his story and talks about the plan he used on his juice fast. He also offers a range of shorter, more flexible plans to make juicing and plant-based diets accessible for everyone. You can begin with this plan if you want to quickly reset your body and get started with a healthy diet. It consists primarily of juices with one plant-based meal each day. If you are new to Rebooting this plan lets you try out juicing long enough to break negative habits. By the end of day five you should be feeling great and have the option extend the juice fast. This plan is recommended if you want to flood your body with nutrients but don’t need to lose a lot of weight. It is also a great plan for dieters who prefer a more flexible way to incorporate juicing into their lifestyle. It involves consuming two fresh juices every day in combination with a plant-based diet. A longer juice fast of fifteen days can help you make more lasting changes in your eating habits and food preferences. You will start with five days of juicing plus eating to help you ease into the diet. In this plan you will eat for five days, juice for five days, then eat for five days. If you want to do a longer Reboot you can just keep alternating between eating and juicing. For a person in an extreme situation with obesity or health challenges a longer juice fast is suggested. It begins with five days of juicing plus eating to get you prepared for 25 days of juicing. Juice fasting for longer than thirty days is not advised without medical supervision. Eventually you will be able to eat three meals a day and incorporate a variety of foods into your diet. However, it is important to transition slowly to a balanced diet to help your body adjust gradually. Fresh fruit and vegetable juice, green smoothies, apples, berries, avocado, tomato, kale, beets, cabbage, arugula, peppers, cucumber, zucchini, bok choy, mushrooms, collard greens, sweet potato, flaxseeds, chia seeds, quinoa, black beans, lentils, almond milk, olive oil, coconut oil, maple syrup. The following is an example of the menu for the 3-Day Reboot. Physical activity is important during a Reboot to preserve lean muscle, promote fat loss, and improve your mood. Light exercise is best, especially in the first few days of the Reboot, as your body adjusts to a reduced intake of calories. Walking, gentle yoga, tai chi, Pilates and swimming are recommended. 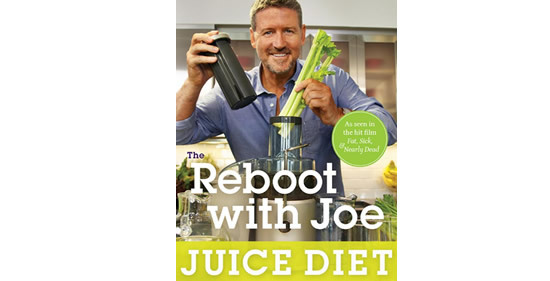 The Reboot with Joe Juice Diet: Lose Weight, Get Healthy and Feel Amazing retails at $16.95. It will also be necessary to purchase a juicer, which will cost around $100-200. Offers plans of different lengths and difficulty so the individual can choose which is most appropriate for them. Includes guidelines on how to correctly transition in and out of a juice fast. Highlights success stories of others who have overcome health challenges with juicing. The author writes in a style that is encouraging and easy to relate to. Reboot with Joe Juice Diet provides recipes for juices and plant-based meals. Extra guidance and support is available for free online. Most people experience some detox symptoms in the beginning such as headaches, fatigue, muscle and joint pain or digestive discomfort. Dieters may not experience as dramatic results as the author due to the shorter duration of the plans. Juicing many times a day can be labor intensive and time consuming. Dieters may experience a slow-down of metabolism on the longer juice fasts due to a prolonged low intake of calories. Reboot with Joe Juice Diet offers guidance for anyone who wants to know more about the health and weight loss benefits of juice fasting. It contains a variety of options from a 3-day introduction up to a 30-day plan for highly motivated dieters. Cross, J. (2014). The Reboot with Joe Juice Diet: Lose Weight, Get Healthy and Feel Amazing. Greenleaf Book Group.